In medium bowl, combine salsa, diced mango and chopped cilantro; mix well. Set aside. In large bowl, combine shrimp and oil; mix gently to coat. Stir in taco seasoning mix and garlic-pepper blend. Heat large skillet over medium-high heat until hot. Add shrimp; cook and stir 2 to 3 minutes or until shrimp turn pink. 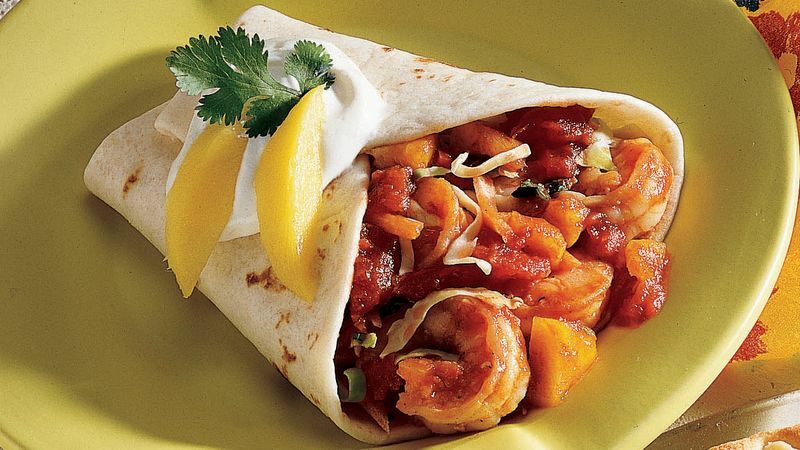 Top each warm tortilla with shrimp, coleslaw blend and salsa mixture. Fold bottom 1/3 of each tortilla over filling; fold sides in toward center, leaving top open. Arrange on serving platter. Garnish as desired.